John Boyega attends the European premiere of Star Wars: The Force Awakens at Leicester Square in London on Dec. 16, 2015. It's John Boyega's moment. He's a Nigerian Brit and a relative newcomer to the Hollywood movie industry, so it's huge that he was cast in a lead role in The Force Awakens, the newest movie in the beloved Star Wars franchise. But while Boyega has been enjoying his moment in the spotlight, he's also been battling criticism from racist Star War fans who are unhappy that a black man was cast as a Stormtrooper. Boyega doesn't seem to mind clapping back at those individuals whenever he's asked about the issue. He did so most recently in an interview with the New York Times. "I'm grounded in who I am, and I am a confident black man. 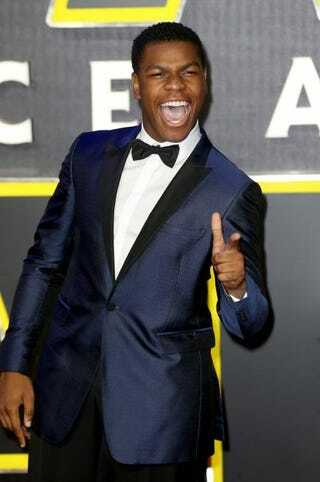 A confident, Nigerian, black, chocolate man," Boyega said. "I'm proud of my heritage, and no man can take that away from me. I wasn't raised to fear people with a difference of opinion." He went on to express a bit of sympathy for racist people, who he says are "merely victims of a disease in their mind." He refuses, however, to waste one second engaging with their line of thinking: "To get into a serious dialogue with people who judge a person based on the melanin in their skin? They're stupid, and I'm not going to lose sleep over people. The presale tickets have gone through the roof—their agenda has failed. Miserably." Bloop. Boyega is flabbergasted that a movie about aliens has people concerned about what complexion the human being actors are playing them. "I just don't get it. You guys got every single alien in this movie imaginable to man. With tentacles, five eyes. […] Yet what you want to do is fixate on another human being's color. You need to go back to school and unlearn what you have learned. I think Yoda said that, or Obi-Wan," he said. When asked if he's happy that he's adding diversity to the Star Wars franchise, Boyega said that he's more happy that he's part of a great ensemble cast that's telling a great story. "It's Hollywood's fault for letting this get so far, that when a black person or a female, or someone from a different cultural group, is cast in a movie, we have to have debates as to whether they're placed there just to meet a [quota]," he said. "I also understand, on the flip side, where these other mentalities will arise. 'He's just placed there for political correctness.' I don't hear you guys saying that when Brad Pitt is there. When Tom Cruise is there. Hell, when Shia LaBeouf is there, you guys ain't saying that. That is just blatant racism." Boyega spoke about his Nigerian parents' reaction to his success, and how they're not all that familiar with or fond of extraterrestrial movies. "They're from a Nigerian culture that has no interest in spaceships and all that nonsense. My dad wants to see real-life stuff. He's a big Bruce Willis fan. But he's caught the Star Wars bug. Mom hasn't. She's just like, 'Where do you come in?' "